Developer Paradox Interactive has announced a save game converter for the upcoming Europa Universalis IV which allows Crusader Kings II fans to import their extant European kingdoms into the new game. Crusader Kings II is easily one of the best games of this generation, assuming we're allowed to judge such things based on how many dozens of hours I've personally spent putting down rebellions, marrying my relatives off to Spanish nobles, and pillaging the Irish coastline with a horde of bearded, Norse death dealers. Like Civilization, it's a strategy title that constantly leaves players wanting to make "one more move," but Crusader Kings II offers far more depth than that title, and single games can span millennia or end in an instant because your character caught VD. Assuming you can avoid syphilis, it would be a shame to lose all those years of progress, wouldn't it? Early adopters will also receive a new Saved Game Converter for Crusader Kings II, which will read the details of a saved game from a Crusader Kings II and convert that into a game that can be played in Europa Universalis IV. Fans of Crusader Kings II will be able to maintain the empires they have established and guide them through the age of exploration in an all-new strategic experience, continuing their personal stories of expansion and conquest. This works out nicely as Europa Universalis IV and Crusader Kings II focus on roughly the same geographical areas, with the former taking place shortly after the canonical end of Crusader Kings II. Between the two games, this should allow players to have a hand in the development of Europe throughout a nearly 1,000 year span that ends shortly before the dawn of the modern age. Are there caveats? Yes. Currently Paradox is only offering this saved game converter to those who pre-order Europa Universalis IV. However, those who do pre-order the game, will also receive a gratis copy of Crusader Kings II which, again, is awesome. 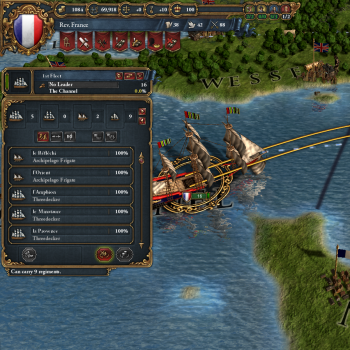 Both of these bonuses and Europa Universalis IV will come available for pre-order on August 1.